WhatsApp is building a local team as part of steps to check fake news circulation. Fake news, which recently circulates through Whatsapp, has lost many lives across the country. We have seen all the suspicions of what's true and what has been found to be false in many parts of the country. 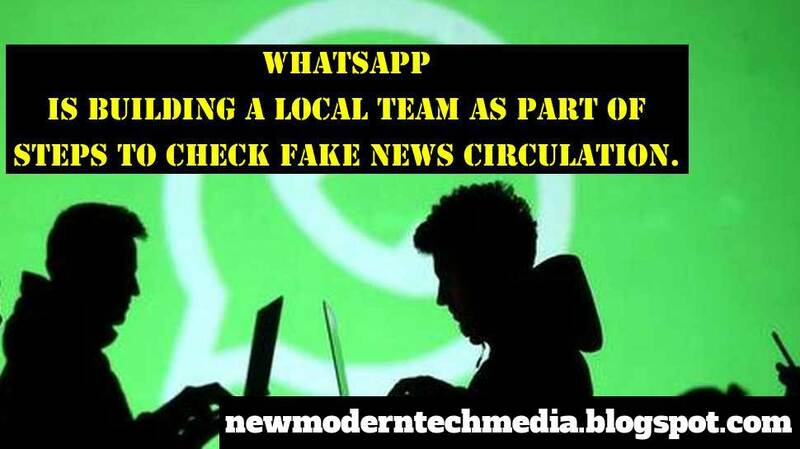 The Department of Information Technology has strongly warned Whatsapp that the Fake News should not be circumvented by Whatsapp. However, Watsap has not been able to do anything better than ever before, forwards to have a Forwarded label, forwards and forwarding messages to newsletters across the country, limiting only one to five. On the other hand, Whatsapp officials have revealed that a special team will be set up to monitor Indian activities in view of the pressure coming from the government. Whatsapp is currently going to create two posts, Head of India and Head of Policy. Thereafter, some of them will have a chance to be appointed. But the Indian government strongly demands the Whatsap company to provide a way to get a watched message from where it started. Only then is the Government idea that Fake News can be interrupted. The same is true. But Whatsapp claims that the personal message of individuals can be understood if anybody knows what it means to disrupt Whatsapp's intentions, so that the abuse of others is more likely to be misinterpreted. according to the information primarily, the government is no longer satisfied with the small correctional actions taken by Whatsapp. And in the case of Whatsapp, the government must wait for any serious action.